CenterStage in Lake Forest had a landmark 47th Season with two splendid theatrical outings that continued to break new ground for our community theatre – and bringing in more new CenterStage patrons than ever before! 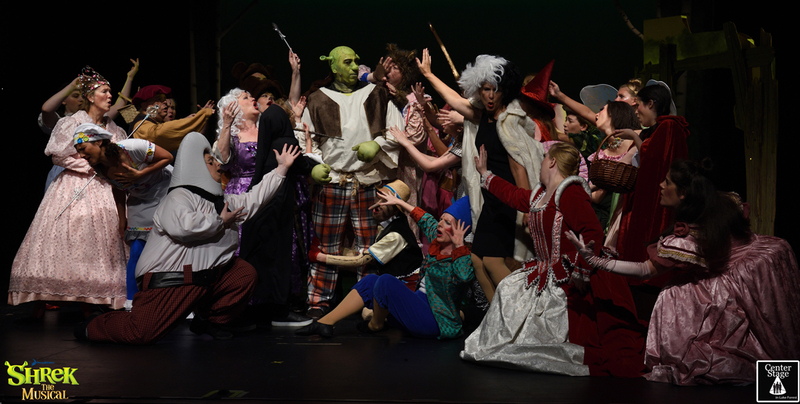 Our summer musical was the fantasmagorical (and rather challengingly adult) contemporary Broadway storybook musical, Shrek the Musical. Based upon the blockbuster DreamWorks motion picture from 1990, Shrek the Musical explored the darker (if more comic) side of fairytale characters, as the fearsome ogre Shrek embarked on a mission with his sidekick Donkey to rescue the beautiful Princess Fiona from her dragon-protected tower, all to win her hand for the plotting opportunist Lord Farquaad. Directed by Deb Goldman, who brought Lerner and Loewe’s classic musical Brigadoon to life in our 46th Season, and featuring a magical, lavishly costumed cast of 35 wonderful singers and actors, Shrek the Musical played to nearly 1600 patrons over eight performances at The Gorton Community Center. For the second year, CenterStage in Lake Forest presented free Shakespeare in The Parks, with Barbara J. Anderson’s fast-paced, wonderfully acted adaptation of Much Ado About Nothing. Boasting a cast of classically-trained professional actors, Much Ado was presented over 12 performances in the parks of Lake Forest and Lake Bluff, and finally traveling to Winnetka and into the city for single performances, advancing the footprint of CenterStage in Lake Forest in both Lake and Cook Counties. All photography courtesy of our good friend Dale Jessen. Click on the banners below to learn more about each production.